A few months back, I made time to read Peter Wohlleben's widely lauded book The Hidden Life of Trees. The author, a practicing forester in the woodlands of Germany's Eifel mountains, offers a refreshing, observations-based narrative of trees, forests, and their invisible tangle of complex relationships. Wohlleben takes the reader through his decades of fieldwork and shares his poignant conjectures on trees and their behavior. His direct experience focuses around beech (Fagus sylvatica) and oak trees in Germany, but when relevant, Wohlleben also pulls in diverse botanical research, ranging from the cottonwoods of Wyoming to umbrella-thorn acacias in the African savanna. Having formerly implemented conventional lumber-harvesting practices himself, the tone Wohlleben establishes is not so much one of judgment as it is an earnest call to reconsider human's understanding of and interactions with trees. Even to those familiar with trees and tree care, Wohlleben has something to offer. Professionally and personally, I have suffered over the violent gashes one finds on tree trunks, both on recently planted street-trees in my urban landscape projects and one energetic dog's damage to the largest tree in my parents' backyard. Over the years, I have watched with relief as some of these assaulted trees close their wounds, but I have also seen the simple, rapid decline of others. As I read this book, I found it answering a question that I had never taken the time to ask: "how does a tree have a shot at survival against fungal attack?" After a traumatic incident, Wohlleben writes, a "tree can lengthen its life-span considerably if it at least manages to get a grip on its external wounds." At the site of a fresh wound, harmful fungi can enter "the trunk because there is no protective coating of bark—at least not yet. But the tree can change this," he writes. If the wound is not too large, "it takes just a few years for the tree to close the gap. The tree can then saturate the area with water from the inside, killing the fungi." In the case that the tree closes its bark but cannot annihilate the degrading fungi, "it will continue to rot on the inside; however, externally it will be as stable as a hollow steel pipe and can survive for another hundred years" (Wohlleben, The Hidden Life of Trees, p128-129 and 153-154). Though reviewers seem to mostly sing praise for Wohlleben's clear writing and fresh perspectives, some have reacted with criticism. The basis of these challenges, directed at Wohllenben's sometimes less-than-scientific word choice and anthropomorphic analysis seems fair to me. Wohlleben's words read quickly and affably, and from the first pages, I could recognize this was no rigorous arboricultural textbook. What I found remarkable about the book was its lightness and freshness. As a landscape architect, I deal with trees on a daily basis: researching, assessing, specifying, and designing improved planting methods for them, and yet, reading these 250 pages was something like a "refresh" button for me. In the weeks after finishing The Hidden Life of Trees, I found myself actually noticing the trees all around me. It sounds corny, but Wohlleben's writing came to me more as inspirational writing or poetry than as popular science. Looking back now at the introduction to The Hidden Life of Trees, I was surprised to see how clearly Wohlleben stated his intentions: "I encourage you to look around where you live...This book is a lens to help you take a closer look at what you might have taken for granted." Indeed, in the first weeks after I finished this book, I was in a higher state of awareness and had an inspired curiosity to look closely and intently at trees. I am sad to admit that this effect has worn off in recent months. Maybe it's time for me to give it another read. The moment rain touches down on a typical building, mankind has fundamentally altered the natural water cycle of a site. Our roofs are successful at creating dry living spaces inside, but by sheltering from precipitation, rooftops incidentally collect and concentrate stormwater. For most buildings in the United States, a storm promises a gathering of rainwater in roof gutters and -- shortly thereafter -- a surging outfall at each downspout location. 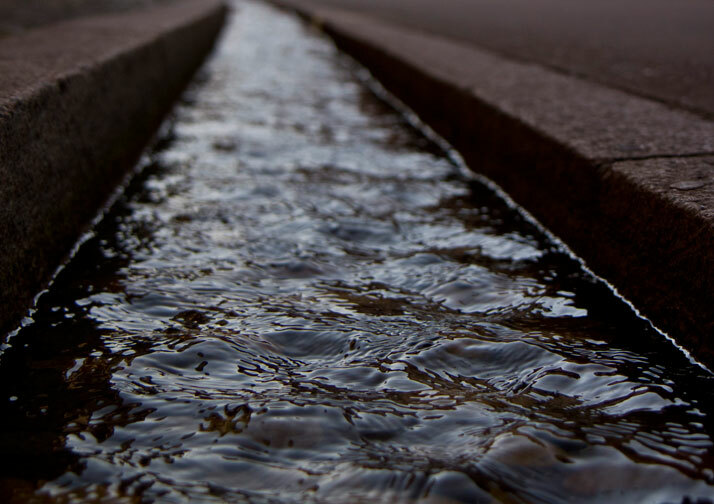 Though most builders still send stormwater down the pipe as if it's a nuisance, there's a steadily growing movement to rethink this water once it reaches the landscape. Many local governments, realizing the toll that concentrated stormwater volumes take on infrastructure, encourage "downspout disconnection." Rainwater harvesting, mostly in the form of rain barrels, has become nearly ubiquitous in the suburbs of America. 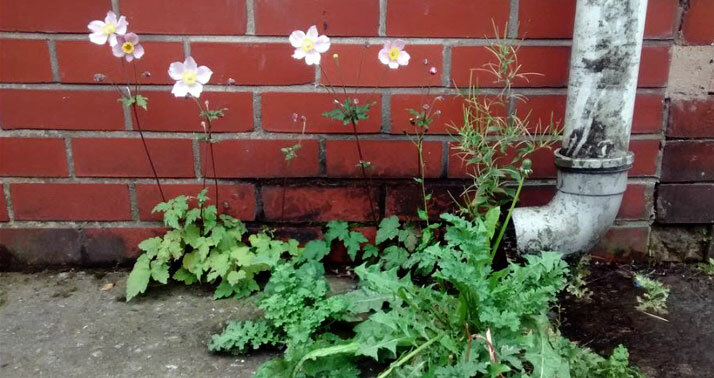 It's certainly good news that every homeowner and building manager can "do their small part" to reduce development's overall impact on the environment, and due to their small size and low cost, these downspout interventions commonly take the form of DIY tinkers. Grassroots green-engineering is a beautiful thing from a social and ecological perspective, but from a designer's view, these small-scale retrofits often appear clunky, feeble, and incongruous with both the architecture and the landscape. For example: all three of the splash-pads photographed above show a marked improvement over conventional downspout treatment. In each case, a retained strip of loose stones likely slows down stormwater runoff, prevents soil erosion, and encourages some amount of infiltration of stormwater into the planting soil. Despite the environmental benefits, each of these examples introduces materials that seem unharmonious with the site. These "orphan" materials match neither the landscape nor the building and exhibit high visual contrast. These splash-pads appear as an afterthought, and attract more attention than their builders probably sought. These next three examples (above) are more successful. These downspout treatments each achieve better harmony with their surroundings by evoking the natural stone of the landscape edging or the brick of the building face. Quiet, graceful integration of stormwater infrastructure into the landscape surface is a noble goal, but sometimes a solution can be buried from sight altogether. Stormwater design gets most exciting, though, when the travel of runoff is expressed unabashedly in the landscape. At many contemporary sites a visitor can observe rainwater in motion and trace its path across the landscape. Next time rain falls, put on a jacket and take a walk around your home, office, or school. Are there missed opportunities to reduce your building's environmental impact? Can these same opportunities be leveraged even further into a landscape expression that is educational, ecorevelatory, or artful? The craggy, volcanic eastern coastline of Maui is not ideal for a morning stroll in flip-flops. Yet, as the sun rose over the black-sand beach at Waiʻanapanapa, I set out for a somewhat venturesome hike in improper footwear. The dramatic views north of the beach -- whitecaps on an indigo blue ocean and waves crashing against black cliffs -- made it all worthwhile. Just as the terrain was not friendly to sandaled feet, it poses a tough setting for plant growth. Imagine an asphalt parking lot baking in the sun, blast it with constant winds, and then spray it down with a daily dose of salt. Most garden plants could not handle even one of those challenges. And yet...there all around me was a spreading blanket of bright green vegetation. Enter the "beach cabbage," known locally as "naupaka kahakai" (Scaevola taccada). In my first few glimpses, this plant struck me as familiar. From various angles, the foliage shape and texture was reminiscent of coastal shrubs like waxmyrtle (Myrica cerifera), succulents like jade plant (Crassula ovata (Mill.) Druce), and even some rhododendrons. Only upon closer inspection did it become clear that this plant is not a species typically seen back on the "mainland" United States. Less familiar than its foliage is beach naupaka's form. The vegetation seems to mound and flow, seemingly creeping towards the ocean like the lava that formed this landscape thousands of years ago. Beach naupaka is a low, broadleaf evergreen shrub that is native to the Hawaiian Islands and other parts of the Pacific. God has given this plant distinct survival traits for an otherwise hostile coastal environment. Beach naupaka has high salt-tolerance and prefers well-drained soils, including pure sand. It reproduces from either cuttings or seeds and transplants readily. Reportedly, its showy white berries are buoyant and remain viable even after a full year of floating in the open ocean. With this in mind, it is not hard to see that -- to the naupaka -- an intense storm or a tall wave is just an opportunity to spread to new shores. 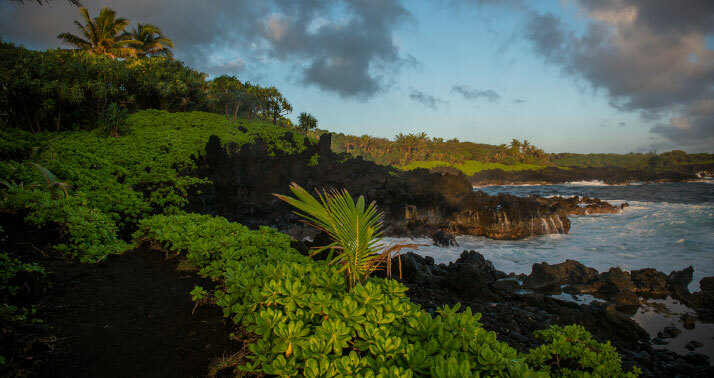 In modern Hawaii's human landscape, naupaka is planted extensively in residential gardens, roadway and parking-lot edges, and even to stabilize dunes at Maui's most luxurious resort beaches. While this plant fits a particular niche in its natural habitat, its unique blend of characteristics and aggressive survival traits can pose a problem elsewhere. On Florida's coasts, naupaka is recognized as an invasive species, and it is reportedly displacing native beach plants such as inkberry (Ilex glabra) and sea lavender (Argusia gnaphalodes). While in Hawaii, it is hard not to marvel at the tenacity, the endurance, and the brilliance of plant species such as beach naupaka. Verdant life has flourished in the sterile dunes and among the inhospitable lavafields, creating a foundation for other forms of wildlife and a beautiful visual composition for human visitors. It is critical to remember, however, that this plant was created for this place, but it is not the plant for every place. Naupaka kahakai is best appreciated in its natural state, Hawaii. With the high drama of waterfalls, craggy bluffs, and a cliff-top temple, Parc des Buttes-Chaumont could be confused with a theme park. Perhaps the artificial rock faces and the faux-bois contribute to this impression, but it is important to remember that the Parc has no carnival rides and no admission tickets. It is a park for all people. On the summer day of my visit, the population of the park stood in clear contrast to the city's more talked-about landscapes. The Parc du Champ-de-Mars, Jardin des Tuileries, and Parc de la Villette were chock-full of park visitors, but between these people's palpable fervor and their clicking cameras, it was clear that a large proportion of them were tourists. 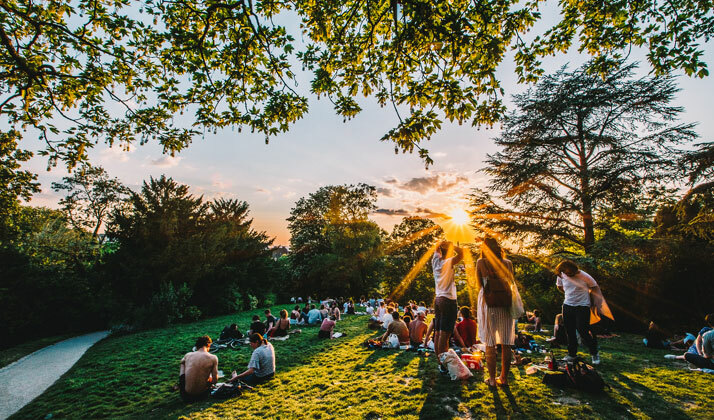 In Parc des Buttes-Chaumont, on the other hand, the majority of people appeared to be locals. The neighborhoods on all sides of the Parc seem to spill into the landscape. As a landscape architect, it is enthralling to see how parks are used. While it is clearly part of the job description to scrutinize topographic design, planting selection, and craftsmanship of such things as stonework, there is more to the story. What could be thought of as a layer atop the permanent, physical landscape is the human activity, or "social life," of a place. At Parc des Buttes-Chaumont, I saw quiet, intimate conversations on park benches, looping joggers and walkers, and children excitedly playing in the small rivulets. Near the end of my expedition, I came across a wildly successful lawn on the south side of the Parc. Like Sheep Meadow in Central Park, this was a sunny, broad, and flat space full of picnickers. As I scaled the lawn with my friend, also a landscape architect, we speculated why so many of the visitors were sitting at the top. It was puzzling, with plenty of open space downhill, why the park users would choose to crowd themselves in one place. The physical attributes of the landscape sprang to the front of my mind. Was the lawn drier at the crest of the hill? Is access easier because of a nearby road? Well, most readers know the disappointment -- whether at a baseball game or on an airplane -- of finding a seat with an obstructed view. The crest of this lawn puts viewers above the canopies of the Parc trees. Only after reaching the top of this hill did it become obvious that this social phenomenon was all about views. Imitation rock and faux boulders are not usually something to write home about. From seeing Rock City, putting around miniature-golf courses, and floating through waterparks, I know that manmade rockwork can be adequate at best and abhorrently tacky at worst. Knowing in advance that the namesake "buttes" would be in large part artificial and having only dubious precedents in mind, I was not sure what to expect when I visited Parc des Buttes-Chaumont. Parc des Buttes-Chaumont is a municipal park in northeastern Paris, France, which had celebrated its one-hundred-and-fiftieth birthday just months before I visited last June. Built on the rugged, abused site of a former gypsum quarry (among other things), the 61-acre park centers around a craggy promontory that thrusts from the center of a wooded lake. Elsewhere in the park, residents enjoy expansive lawns, hilltop vistas, a Gustave Eiffel-designed pedestrian bridge, and a partially obscured grotto. 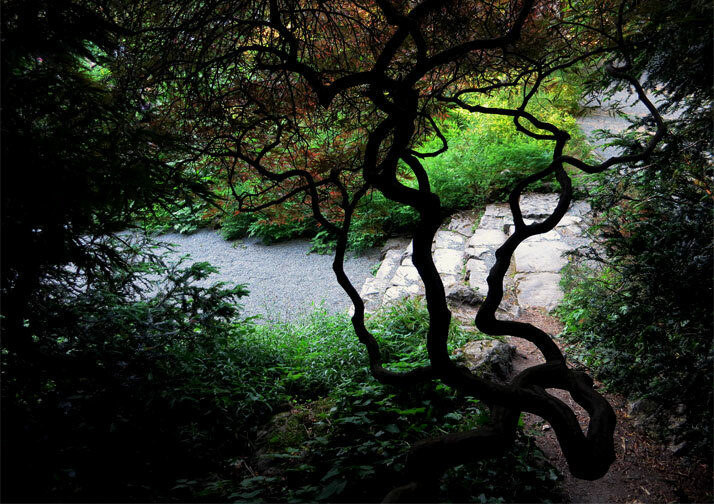 Tying all of this together are miles of elegantly swooping avenues, paths, and trails. Back in college, my professor had made clear that the craggy cliffs that define the park were largely concrete, but it required an actual visit to comprehend the extent of the faux-natural concrete work. Up close it becomes clear -- at least to a discerning eye -- that the "rock" walls and the stalactited grotto are surfaced with concrete. Walking other areas of the park, though, I found even "wood" steps, posts, and railings to be falsified. Further research after I returned home helped me to realize that "faux bois" is a recognized artisanal style and to appreciate its history in the context of Paris' historic 1867 World's Fair. 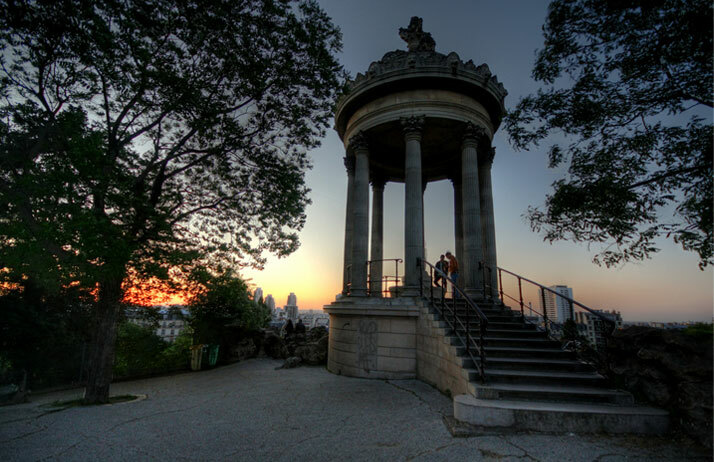 The climax of a visit to Buttes-Chaumont is ascending to the Temple de la Sybille and standing still for a minute. If you have seen a postcard of this park, the Temple is undoubtedly in the view. Designed and sited as an homage to the Temple of Vesta in Tivoli, Italy, this circular colonnade seems to almost overhang the precipice of the butte. From the elevated temple, viewers can consume a full panorama of the park and the city beyond. I was lucky enough to visit at sunset. The park landscape plays host to active and passive users, and during my visit I sensed that it is a beloved part of the neighborhood. Venturing through the park gives a visitor moments of drama and surprise, but on the whole, the landscape is far more stately than it is flashy. Among designers, there is a quest for authenticity that conjoins with an often rabid rejection of counterfeit materials. Landscape architects hold a justified stigma against false stone, but -- for lack of a better word -- it was folly of me to carry that prejudice into Parc des Buttes-Chaumont. 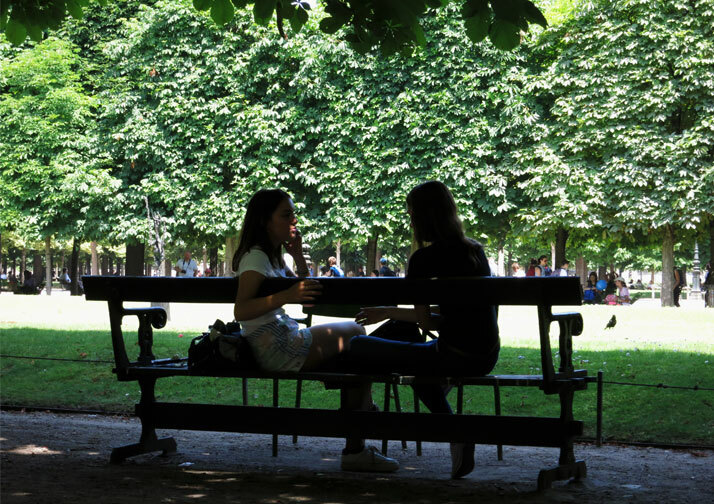 One of the best demonstrations of dueling Parisian light and shadow can be found at the Tuileries Garden just west of the Louvre Museum. In basic terms, the Tuileries is a simple but successful composition of tree plantations over a carpet of stonedust. The history of the Tuileries is far more complicated than a visitor might detect. Before it was a garden it was a blackened ruin; prior to that it was a glistening palace for emperors and kings. On the sunny summer day when I visited, as the stonedust crunched satisfyingly beneath my feet, I noticed that the allées and gridded bosques read like a diagram of where to sit and where to walk. Benches are evenly distributed through the grounds, but I observed only the tree-shaded seating drew people to lounge, socialize, and bring together family-style picnics. Meanwhile, hedged by strong allées, the wide, exposed promenades remained clear for strolling. The most fascinating moments of light and shadow occurred around the Tuileries' lawn quadrangles. Situated like glades in the gridded forest, these brightly illuminated rectangles of turf drew visitors right up to their edges. Even with the lawns bereft of action (ropes were standing guard), park users of all ages had situated themselves around these lawns in true theater-in-the-round style. The Tuileries Garden is a place of both expanse and intimacy, and even on a cloudy day, the landscape would be worth writing home about. On a sunny day, however, it becomes a compelling study in both visual contrast and the importance of microclimates to visitor comfort. With an onslaught of summer sun, the simple layout of trees projects order, structure, contrast, and thematic emphasis into the garden. Even before leaving the airport, a visitor gets a sense that something is up in Paris. A portion of it -- surely -- is that you have just arrived in a famed city among throngs of people who have come see if "Grand Paris" lives up to its reputation. Paris is affectionately called the "City of Light" (Ville de Lumière), and the nickname relates, in part, the metropolis' public-realm lighting, beginning in the mid-19th century and becoming only more dramatic as modern, electric lighting replaced gas lamps. Without effort, people around the world can call to mind the glowing Louvre Pyramid and a sparkling Eiffel Tower that projects lighthouse beams across the night sky. During my visit in June, I even encountered luster in surprising places, like a polished stainless-steel bench in broad daylight. So sure, light is a big part of what makes it Paris, but something else comes into focus as visitors walk its streets, its gardens, its parks, and its cemeteries: shadow also gives the city its strong character. It is the dark shroud beneath the city allées that makes penetrating dapples of sunlight something noteworthy. The long silhouettes that stretch across cobbles and stonedust turn simple pedestrians into photogenic compositions. It is no secret that shadows on a building face are what grants architectural relief and contrast; without the disagreements between light and shadow, ornamentation cannot be read. During morning and late-afternoon, though, I was struck by the dark sides of Parisian buildings, appearing strikingly against a bright sky. In the visitor's plaza beneath the Eiffel Tower, there is an entire atmosphere of shadow. At many times of the day, you can find yourself walking across a dark lattice, projected down from the iron framing above. Looking skyward heightens a visitor's awareness of the intricate ironwork, standing as an inky lace against the blue backdrop. It may already be obvious to the reader that I have an admiration for works of art and landscape that are deceptively simple or, sometimes, simply deceptive. In Budapest, Hungary, one of the city's most recognizable structures, Liberty Bridge (Szabadság híd), was built at the end of the 19th century as a link between the towns of Buda and Pest. Today, as a visitor walks along the Danube River, the bridge beckons with its striking composition of elegance and muscle, in equal parts. Like the Brooklyn and Williamsburg Bridges in New York City, the swooping sinew of Liberty Bridge promises chain- or cable-suspension, but when one gets up close, crossing by streetcar or shoe, the structure is all rivets and iron plates. The deceiving nature of Liberty Bridge serves as an allegory of the Budapest I encountered while visiting for a few days last summer. The city calls you to take a closer look at its design and detailing, and what you find is a rewarding revelation. About two miles north of the Bridge, a very different place is also best understood at second glance. Wrapping the eastern face of the Hungarian Parliament Building, Kossuth Lajos tér is an expansive public garden square. Having been recently renovated from an unceremonious parking lot, Kossuth Square is spacious, finely detailed, and invites celebration and even play. Robust granite walls and plaza paving establish an environment of clean, modern lines and enframe generous lawn and garden beds. Wood-capped walls provide visual warmth and comfortable seating. On central axis with the Parliament, misting jets and an infinity-edged reflecting pool activate the plaza and encourage participation. Kossuth Lajos tér's creative design approach can and should be carried onto all sites: public and private, large and small. On any project, a designer should ask whether a fence could be more (or less) than a fence. Utilitarian purposes can be revealed under more thorough inspection, but at first glance a landscape should be about what matters most - the people who use it. When speaking to a person who has visited this Bohemian capital, the name "Prague" is often said with a knowing inflection. Sometimes this change of pitch is misinterpreted as snobbery or arrogance toward those who have not been, and sometimes that is exactly what it is. Nevertheless, when I arrived in Prague, I carried high expectations along with my luggage. Prague is renowned for a vibrant arts scene, its progressive culture, and a well-preserved collection of centuries-old buildings and streets. In just an hour of walking the city, I felt these promises had been met, but there was more to the story. Most of my visit was spent in "Old Town" and the still respectably ancient "New Town." In my first few steps, I found myself hypnotized by something as unassuming as a security gate. With dynamic geometry reminiscent of a wind spinner, the wrought-iron gates into the Franciscan Gardens dramatically change perspective as one walks between them. The next day, outside St. Vitus Cathedral, I looked underfoot and found that a utilitarian cast-iron drain had been crafted as a piece of modern art. Tilting one's eyes a bit higher, a tourist will find Prague's architecture exactly as advertized. Picturesque stone bridges stitch the city together across the banks of the Vitava River. Ornate churches, soaring towers, and even "dancing" modern works line the city streets. By the end of my second day, my sneaking sense had firmed up into something more concrete. Patterned cobbles, carved stonework, manicured parklands: nearly every inch of the Prague cityscape has been painstakingly considered. Perhaps this "Old World" craftsmanship is more pronounced to the eyes of an American, in whose homeland asphalt, sheet-metal paneling, and plywood all too often reigns. To me, Prague creates an illusion that the city was "finished" being built hundreds of years back, and that the time since has been spent merely fine-tuning and perfecting the composition. Viewing Prague, both up close and from grand vistas, reveals a city that is not fussy but has been fussed over. Studying built environments outside the United States reveals differences not only in architectural styles but also in cultural expectations. In my previous post I described the Alhambra, a hilltop fortress situated over the historic city of Granada, Spain. Given the city's past, finding buildings, streets, and plazas rich with historical character was anything but a surprise. As I walked through the gardens and open spaces of Granada, however, I did not expect to find such proud strokes of modernity. Only a mile from the Alhambra, Forum Plaza abstracts the Sierra Nevada mountains in sharp, contemporary weathering steel. A few blocks closer to the city center, tucked behind the Parque de las Ciencias, similar angular forms soften themselves into a park-like setting. Here, under a welcome canopy of shade trees, slices of plate steel form short retaining walls and the edging for lush beds of planting. The color palette of the Parque is decisively streamlined: the rich greens of the foliage play nicely against the silver-grays of the birch bark, metallic edging, and concrete. Back at the heart of Granada, twin runnels flank the central promenade of the Jardines de Triunfo. Flowing quietly in the shadow of a dominating display of fountain jets and waterfalls, these tilted water basins are by no means the headliner, but the patterning on their floors -- crisp, geometric, and modern -- speak volumes about the culture of Granada. What I observed in Granada exemplifies what can be seen with relative consistency in developed nations beyond the borders of the United States. In two public parks only a thousand feet apart, stand two very different metal fences. One dates back at least a century, the other is less than a decade old, and their styles are anything but congruent. Granada celebrates and preserves its medieval Moorish palaces as a testament to its historical lineage, but it is not afraid to plant its other foot in the future. As with many cities in Europe, the city unabashedly exerts its modern architectural might right alongside its heritage buildings and landscapes.